At Bathroom Place we want to ensure you get the best quality bathroom vanities. That is why most of our vanities are made out of solid wood. They are stained inside and out to give you that quality feeling when opening the components. The type of solid wood used is commonly known as Rubber-Wood (Hevea brasiliensis) from Malaysia also known as "White Mahogany" or "Malaysian Oak". It has been Kiln dried under high pressure and finger-jointed to prevent wood warping. This kind of wood is not only beautiful, but is also solid and environment friendly. All wood pieces include multi-step furniture grade finish. The hardware system has also been taken care of. The heavy duty soft-close hinges and anti-slam drawer rails are guarantied for life. 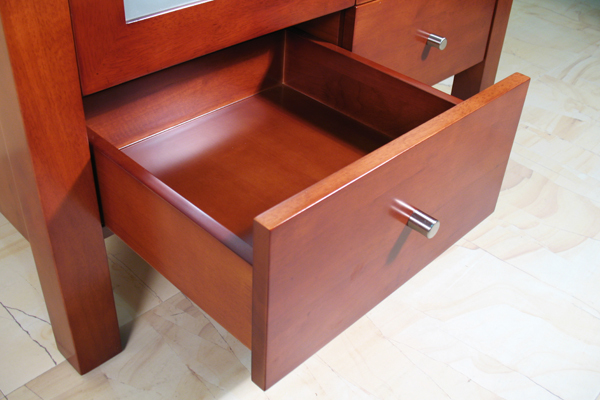 Most of our vanities are equipped with under-mounted drawer rails for a clean and modern look.